Whether if you like creamy soft serve, hand scooped ice cream, ice cream cookie sandwiches, or fruity whips, you’ll discover that there is no shortage of tasty ice creams at Walt Disney World. Below, you’ll learn some of the best ice cream that you can enjoy at all the Disney Parks and Disney Resorts. So with that being said, let’s jump straight to the sweet listing. Here are all the best ice cream treats that you can get in Disney World. I swear the ice cream from the France Pavilion in Epcot tastes bette than anywhere across Disney World. Get this from Les Crepes de Chefs de France. Get the pineapple Dole Whip swirled with vanilla and you have the creamiest Dole Whip possible. Get this from Pineapple Lanai from the Polynesian Resort and Aloha Isle in the Magic Kingdom. Delicious Sprinkles freshly made ice cream sandwiched between those world famous cupcakes. Get this from Sprinkles in Disney Springs. The game changer is the freshly made waffle cone. And oh yeah, swapping out the hot fudge with warm peanut butter. Get this from The Plaza Ice Cream Parlor in Magic Kingdom. The best bargain for any dessert in Disney World hands down. Get this for under $5 from Hollywood Scoops in Hollywood Studios. The classic premium ice cream bar that everyone needs to have at least once during every Disney World visit. By far one of the best ice cream flavors I’ve ever had. Literally tastes like super chewy poundcake and deliciously creamy ice cram. Get this from Ample Hills Creamery at the Boardwalk. One of the little known Epcot treats. Delicious Italian gelato sandwiched between chocolate chip cookies. Mmm. Get this from Gelati in the Italy Pavilion in Epcot. French ice cream served in a martini glass topped with Grand Marnier. Get this from L’Artisan des Glaces from the France Pavilion in Epcot. Great way to cool off after conquering Expedition Everest. Get this from Anandapur Ice Cream Truck in Animal Kingdom. 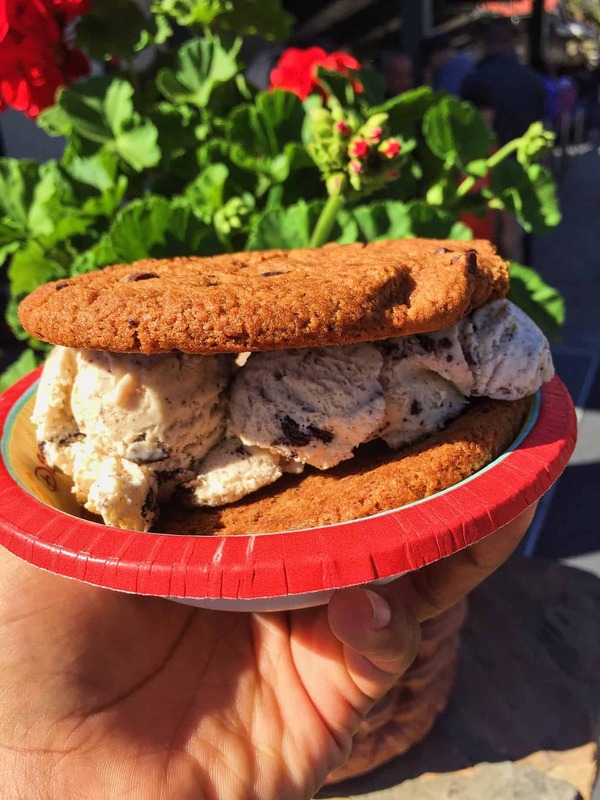 Classic ice cream sandwich that you can find at all the parks and Disney resorts. Fresh ice cream pressed into a soft brioche bread. The most unique tasting ice cream that’s perfect for ginger lovers. Get this from Lotus Blossom Cafe in the China Pavilion at Epcot. Literally tastes like an orange creamsicle. Not as good as Dole Whip, but still pretty good. Get this from Sunshine Tree Terrace in Magic Kingdom. French macron filled with handcrafted ice cream. Great tasting and refreshing sundae. Get this Auntie Gravity’s Galactic Goodies in Magic Kingdom. Soda and vanilla ice cream? What a perfect combination. One of the best best sundaes in Disney World for anyone who’s addicted to hot fudge and warm peanut butter. Get this from Beaches and Cream at Disney’s Beach Club Resort. Basically any sundae from Ghirardelli is a winner. Get this from Ghirardelli at Disney Springs. The biggest, baddest sundae at Disney. Plus it’s topped with a whole can of whipped cream. Get this from Beaches and Cream at the Beach Club Resort. For more delicious Disney food suggestions, be sure to follow me on Instagram! Thanks for reading and hopefully this listing helps you discover the best ice cream treats in Disney World. And if you have any other great suggestions, please leave a comment below. Share This Ice Cream List! Thank you so much for posting this! You’ve made my 3-yr-old so happy – the boy is looking at all of the desserts over and over and over again.